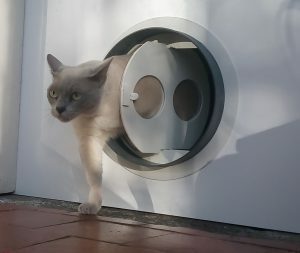 Will the Ecoflap fit my door? The Ecoflap fit has been designed to suit most doors, but as with anything that needs to accommodate many varied doors, letterplates and door holes, there are some limits. 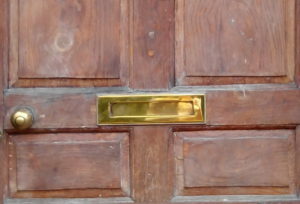 There is no standard letter box size or style in the UK, with variations including push in or lift up; horizontal, vertical; set into walls, doors or fences; top of the door, middle or at ground level etc etc. Even so, we find the Ecoflap fit works with most standard doors. TIP: This is easiest to assess on the inside of the door and after removing the current draft proofing solutions. 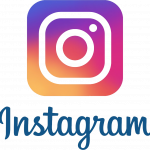 Your letterplate must be a horizontal style not vertical. The Ecoflap is 32mm deep. Door hole should be no bigger than 255mm x 40mm (this is so that post doesn’t bash against the Ecoflap mounting. See below under The door hole is too large for more information.). The flat part of the door you fix the Ecoflap to must be at least 320mm x 100mm. The outside edge to edge of the securing nuts for the front letterplate should be less than 285mm apart. To see precisely how your letterbox will work with Ecoflap you can find detailed measurements here in a PDF file Sizes. If that’s all ok, then please go ahead and buy your Ecoflap now! That’s fine. The Ecoflap is a completely self-contained unit that fixes to the inside of your door, so the push in flap of your letterbox shouldn’t interfere with the Ecoflap doing its job unless that flap is particularly large. Really big push in flaps (bigger than usual) might hit the Ecoflap’s lifting widget and over time damage it. Please get in touch if you’d like to check this with us prior to purchase, and be sure to include the dimensions of your letter box flap and the door depth. 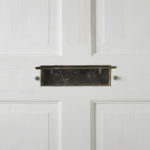 The other thing to bear in mind is that the letterbox flap folding into the aperture usually reduces the depth of the letterbox by 10-20mm, which in turn restricts the maximum thickness of parcels that can go through the letter box and Ecoflap. This doesn’t prevent the Ecoflap working just fine, but it means you won’t get the full benefit of the maximum depth to which the Ecoflap can open. You should have no problem with the Ecoflap fit. A lift up letterbox doesn’t interfere with the Ecoflap’s mechanism in any way as the flap doesn’t come into contact with it. Sorry, at this time we don’t have a suitable Ecoflap for you but we are working on it. The reason the hole size is important is to stop post being rammed against the Ecoflap mounting rather than through the flap. You can reduce the size of the interior door hole using wedges or slats (usually made of wood or plastic) so that it meets the 255mm x 40mm. In most likely situations this will not show on either side of the door until the front plate is opened. Ecoflap is this scale so that it can sit flush against the door and properly seal to it. If the bolts are a 2mm or so too big, you may find tightening or loosening the bolts a fraction will align the flat sides of the bolts better, reducing the distance. The best option is to recess the nuts and bolt ends so they are flush with the back of the door. This would require counter-syncing of the hole – making it wide enough to accomodate the nut width and deep enough to contain its height. It may also require the bolts being cut shorter so they too are below the door surface. NB If you attempt this last option we would be unable to accept any return of the Ecoflap. Shift the Ecoflap slightly to one side of the door hole such that you could keep one nut and bolt within the Ecoflap housing and then drill a hole in the mounting flange.